Let the attack ad games begin. 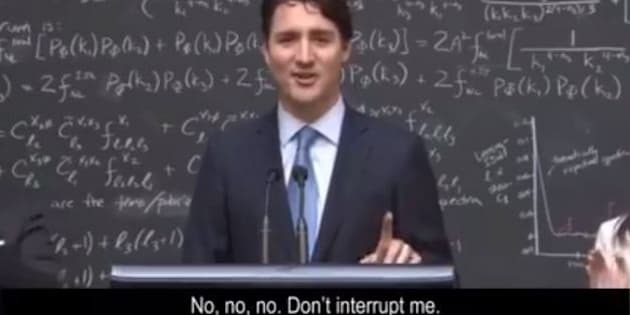 The Conservative party has used a viral video of Justin Trudeau explaining the basics of quantum computing in an attack ad. The Tories uploaded the clip to Facebook on Tuesday, titling it "How To Avoid Serious Questions With Justin Trudeau." Footage of Trudeau captured while he was at the Perimeter Institute in Waterloo, Ont. on Friday shows him responding to a question about Canada's ISIL mission with a brief explainer about quantum computing. "I was going to ask you to explain quantum computing but... when do you expect Canada's ISIL mission to begin again, and are we not doing anything in the interim while we prepare?" Colin Perkel from The Canadian Press says in the clip. Trudeau, who had learned about the issue at the centre earlier in the day, then gives what one expert called a "quite accurate" explanation of quantum computing. The Conservative ad ends with white text on a black background reading: "Sorry Mr. Trudeau, Serious Questions Need Serious Answers." The ad does not mention that Trudeau went on to answer Perkel's question after finishing his quantum spiel, and the initial video — uploaded to YouTube by CBC News — ends before Trudeau touches on Canada's ISIL mission. The CBC video also does not show Trudeau, earlier in the event, say he was "really hoping people ask me how quantum computing works because I was excited to deepen my knowledge of that this morning." The video spread quickly as international media outlets picked it up, with many praising Trudeau for being a leader knowledgeable about the topic. Others attacked it and suggested it was likely a publicity stunt, something Trudeau's office denied. “It was not staged. I was there," Trudeau’s press secretary, Cameron Ahmad, told Gawker. Trudeau's knowledge, or at least interest, in quantum computing was already being noticed before the press conference had started, according to Maclean's. Raymond Laflamme, co-founder of the Institute for Quantum Computing at the University of Waterloo, told the magazine he was "flabbergasted” when the prime minister inquired about high-temperature superconducting systems.